Applying a force on a paramagnetic bead, using an electro magnet. The high force magnetic tweezer device is a scientific rheometer used to study the mechanical properties of biological materials in the micrometer range, especially the cytoskeleton of cells. Measuring the mechanical properties of cells enables to investigate the dynamics of cellular force responses which are crucial for cell migration. This noninvasic technique consists of an electro magnet applying precise forces without any contact to small micron sized magnetic particles that are bound via focal adhesion complex to the cytoskeleton of cells. During force application, the displacement is measured in real time, using optical bead tracking. 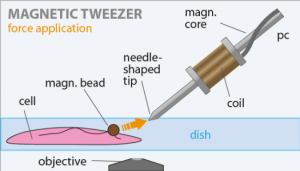 High-force magnetic tweezers with force feedback for biological applications.